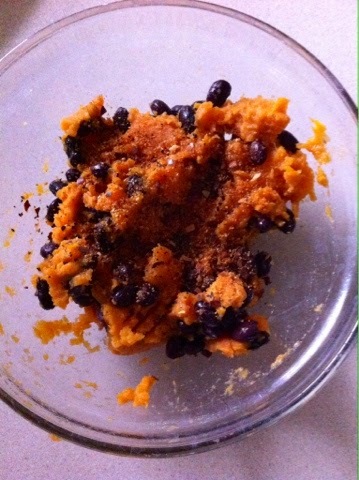 I made baked sweet potatoes to go with dinner and ended up with one leftover. So, I tossed it in the fridge and figured I'd use it for something later on. DON'T toss in the garbage or give to the dog! Well, if you really want to give it to the dog, I guess your pup will love ya for it. 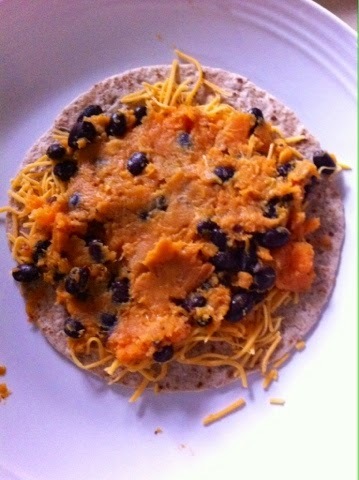 I decided to use my leftover sweet potato to make breakfast quesadillas. 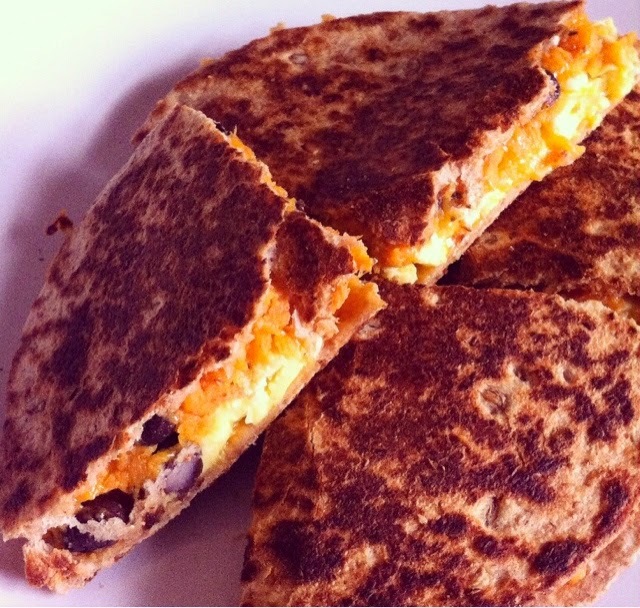 Quesadillas are so versatile and you can put just about anything between two tortillas. 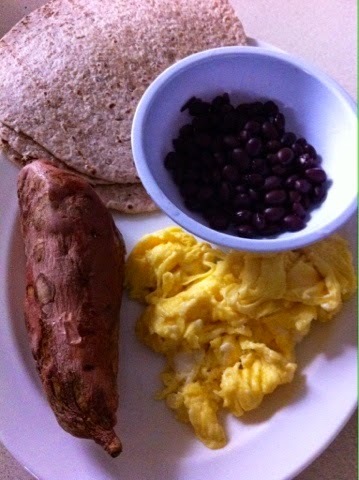 This is a wonderful breakfast start and the sweet potato and black beans have great protein and health benefits to make it a healthy breakfast. 1. 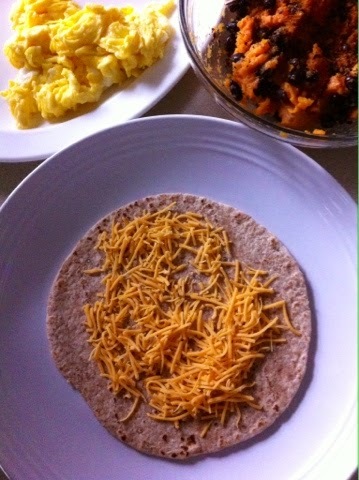 Start with 1/2 cup drained and rinsed black beans, 1 baked sweet potato, 3 scrambled & cooked eggs and 4 tortillas. 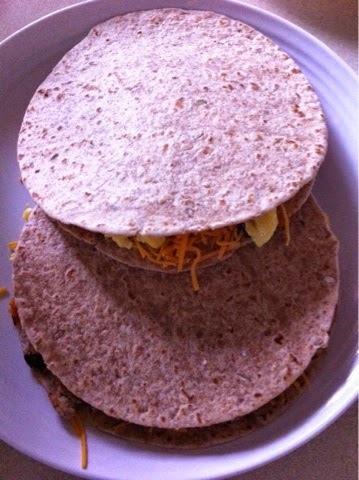 I used whole wheat tortillas. 2. Cut the potato in half and scoop out the sweet potato into a bowl. so you don't have cold spots in your finished quesadilla. 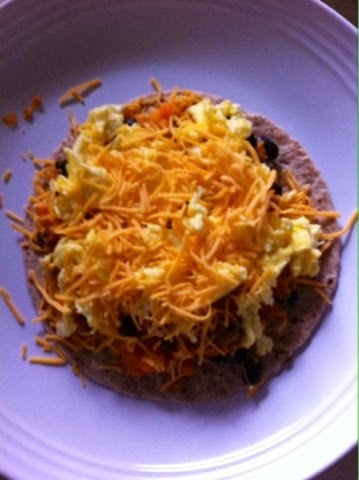 cheddar cheese on the tortilla. over the top of cheese. potato mixture along with more shredded cheddar cheese. crispy crunchiness on the outside and the melty goodness on the inside. medium heat. Once skillet is warm, gently place 1 quesadilla in skillet. press it all down and get everything to bind together. 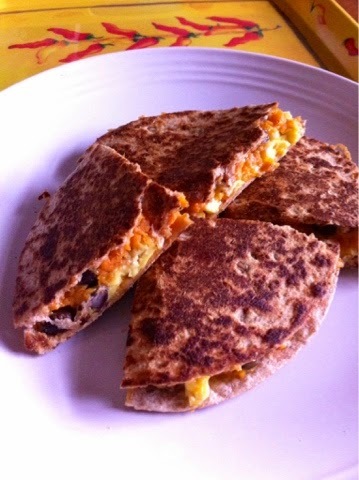 After a minute or two, carefully remove jar and plate and with a spatula flip the quesadilla to grill the other side. 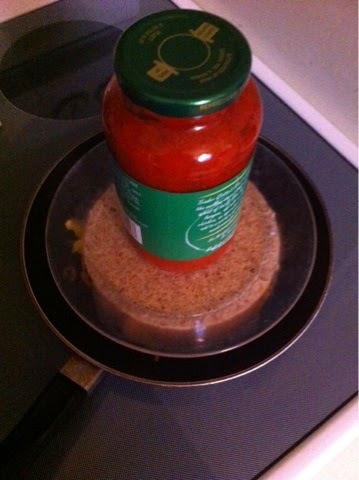 Once again, replace the plate and jar on top. When it's a golden brown, remove from pan and cut into quarters. There ya go! Your tummy will be happy and "Fido" will have to get spoiled another time!! I want this for dinner tonight! YUM!! !